FILE - Afghanistan's National Army soldiers take positions in Khogyani district, in Nangarhar province, east of Kabul, Afghanistan. Officials and witnesses in Afghanistan say fighters linked to Islamic State have regained control of most of the militant group's former strongholds in the country, weeks after retreating to remote mountain hideouts in the face of major Afghan security operations. The troubled areas are located in Achin, Naziyan, Kot and Haska Meena districts of the eastern Nangarhar province, which borders Pakistan. A reporter for VOA’s Afghan service this week traveled to Achin, the main IS base in the country, and says government security forces have relocated to positions they were occupying prior to the launching of an anti-IS “Qahr-e- Sellab” offensive in June. Regional military spokesman Shreen Aqa confirmed to VOA that IS militants have returned to parts of the troubled districts, but said Afghan forces are preparing to undertake a fresh offensive for their eviction. 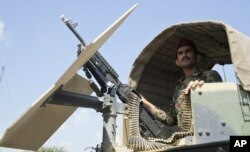 Afghanistan's National Army soldier stands guard in his vehicle in Camp Khogyani in Nangarhar province, east of Kabul, Afghanistan. Tribal elders from the area have repeatedly warned IS was trying to return to its former bases and criticized Afghan authorities for not paying attention or establishing permanent security posts after concluding the previous operations. IS launched its regional operations early last year in about 10 districts of Nangarhar, but stiff resistance from the rival Taliban and repeated U.S. counterterrorism drone strikes confined them to three or four districts, according to officials. The operations in June and July were “very successful” because they eliminated IS regional chief, Hafiz Saeed Khan, along with 11 other top leaders and killed 25 percent of its fighters, General John Nicholson, the top U.S. military commander in the country, noted last week. “We estimate there numbers are 1,200 or 1,300 fighters. They have some enclaves in (neighboring) Kunar province, but primarily they are in Nangarhar province,” Nicholson told reporters on Friday. Primarily Pakistani ethnic Pashtun militants who were previously part of the anti-state Tehreek-i-Taliban Pakistan in the neighboring country fill Islamic State's regional ranks, the general said. “Their goal is to establish their caliphate, the Khorasan province, with Jalalabad as the capital and Nangarhar as their initial caliphate,” he added. IS has declared Afghanistan, Pakistan and parts of Iran as its Khorasan province. General Nicholson confirmed there are “linkages financial, leadership and strategic communication” between the Nangarhar militants and the main Islamic State back in Syria. IS has also claimed responsibility for several attacks in Pakistan. But the Pakistan military earlier this month announced it has "forestalled" attempts by the group to expand influence in the country. An army spokesman said security forces have arrested more than 300 militants linked to the Middle East-based terrorist group, including its main leadership, since it began operations in Pakistan last year.